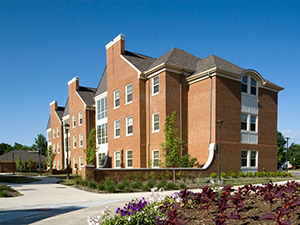 Heritage Commons was built in 2005 and is a complex of six apartment-style halls for second year and upperclass students. Each of the fully-furnished apartment units consists of four private bedrooms, two bathrooms, full kitchen, dining, and living spaces. A central community building provides a central social space as well as a mailroom, laundry, vending, and restrooms. It is conveniently located beside the REC Center and is close to Maplestreet Commons and more. Meal Plans are optional at Heritage Commons. Many Heritage Commons residents choose to use a convenient Miami Express Meal Plan each semester. Desk: 48" x 24" x 30"
Dresser: 24" x 24" x 43.5"
Bookcase: 24" x 18" x 29.25"
Mobile pedestal: 24" x 18" x 24"